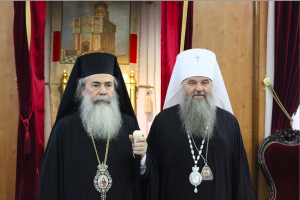 On 12 October 2013, Metropolitan Varsonofy of Saransk and Mordovia, chancellor of the Moscow Patriarchate, arrived in the Holy Land. That same day he met with His Beatitude Theophilos III, Patriarch of the Holy City of Jerusalem and All Palestine. In the evening, Metropolitan Varsonofy officiated at All-Night Vigil at the Cathedral of the Trinity, and at night – at the Divine Liturgy in the Church of the Holy Sepulchre. Clerics of the Russian Ecclesiastical Mission and those who arrived together with His Eminence concelebrated. On October 14, the Intercession of the Most Holy Mother of God, Metropolitan Varsonofy celebrated the Divine Liturgy in the Gorny Covent, website of the Mission reports.